This video is called Alfred Russel Wallace Pt1. An A-level student on work experience at an Oxford museum has found rare examples of butterflies lost since the 19th Century. 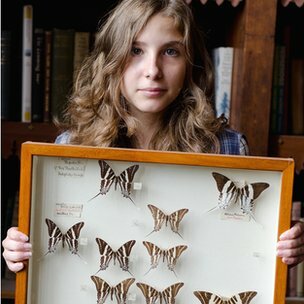 Athena Martin, aged 17, has found butterfly specimens described as “priceless” by the Oxford University Museum of Natural History. They had been brought back from South America by a Victorian naturalist. Many of the butterflies were thought lost at sea in the 1850s. Ms Martin’s discoveries came during the summer when she was taking part in a science-related work experience project. The school girl, who wants to study zoology at university, found and identified butterflies collected by the naturalist Alfred Russel Wallace.